Four weeks ago, we wrote that the strike by the Indian Air Force against the Jaish terrorist training complex at Balakot was a mental breakout by India. It was a change from soft deterrence of words & appeals to a hard deterrence of destructive pre-emptive strikes against terrorists preparing to attack India. India always had the physical power & capability to do so. But governed by lackeys who always looked for permission & approvals from The Economist & the New York Times, that previous India was cowardly & gutless. Four weeks ago, led by a patriotic & veteran PM Modi, the newly confident & assertive India changed to hard deterrence. This week, we saw another realization of this change from soft deterrence to hard deterrence. India successfully tested an Anti-Satellite missile by using it to shoot down an old Indian satellite. This offensive capability is principally out of a critical defensive need. Today satellites are critical for many of a country’s capabilities & destruction of a country’s satellites can render that country & its mission-critical communications systems virtually useless. India’s greatest military challenge comes from an aggressive China & its global ambitions. No amount of soft deterrence could ever prevent China from destroying Indian satellites in a hot situation. Only the threat of its own satellites being destroyed might work. Of course, India is nowhere near that capability. But a notice has been served. Such a display of potential hard deterrence substantially upgrades India’s soft deterrence as well. After all, India is now only the 4th nation in the world to have demonstrated proven anti-satellite weapon & technology. How does this week’s anti-satellite test by India fit in the evolving US-India relationship? Remember how President Clinton reacted when India, under the previous BJP government, conducted their first nuclear test in 1998? That was an America that considered India on par with NonPakistan & much lower than China. In fact, the Clinton Administration was fully committed to stopping any nuclear tests by India and the CIA was conducting intense surveillance of the site & of India’s nuclear agency. Despite that, the Indian team managed to conceal its operations & conducted the nuclear test*. As George Tenet, the then CIA Director, said after the test:. Indrani Bagchi‏ @IBagchiTOI Mar 27 – What a difference 20 years makes in a relationship. 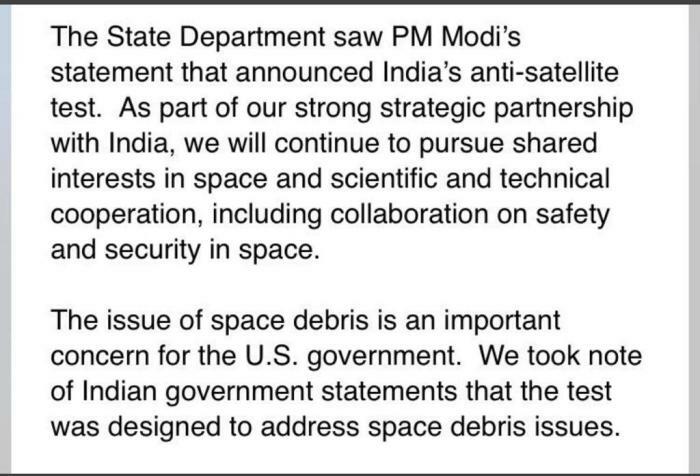 Here’s the US statement on India’s ASAT test. An endorsement if there was one. The Indian anti-satellite test was conducted to send a direct message to China, India’s direct & most antagonistic neighbor. China is determined to become the hegemon of Asia & ideally the southern Indo-Pacific region. The only Asian country that stands in its way in terms of size, heft & potential economic & military challenge is India. China is deeply concerned that, in a conflict with America for the South China Sea & the Pacific, its southern side could be exposed & vulnerable to India & its increasing military & naval strength. That is why China has been building up the Nonpak military to challenge India & free China to face the pacific. But that is an old & increasingly unsuccessful gambit. India is rapidly passing ahead of NonPak & beginning to directly engage China. The first evidence of this came in the recent direct confrontation with China in a strategic corner of Bhutan called Doklam. The second was the recent air strike by the Indian Air Force on the NonPak terrorist camp at Balakot, deep inside NonPak territory. There was nothing China could do to prevent or stop it. Now the third is the Anti-Satellite test this week. This brings India & Japan together because as, Asianwarrior.com puts it, “China will not target US satellites first and will instead wage a proxy war with Japan and India“. Conversely, America simply cannot afford to let China destroy the satellites of Japan & India without losing its superpower standing & without losing the support of all Asian nations. And Japan is still a pacifist country & has serious internal obstacles about building up its military capabilities. In contrast, India has already shed its own reticence and moved explicitly from soft deterrence to hard deterrence. In another five years with Narendra Modi as PM, India will present a very different economic & military posture towards China. This, in itself, will be to a win-win strategic benefit for both America & India. *The intensity of the CIA surveillance and how the Indian Nuclear Agency & Government succeeded in fooling the CIA is told in a superb film Parmanu. The clip below shows the last few minutes of the film and the dash by the CIA to President Clinton to alert him while the US Ambassador to India was in the office of India’s Prime Minister Vajpayee. It is a captivating film. Watch it on Netflix.